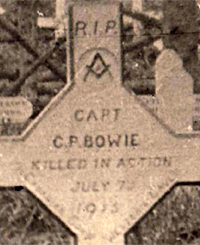 Born the eldest son of a London civil servant, by 1911 George Pigrum Bowie was working in Vancouver as an architect. He designed the original Lumbermen's Arch, erected at Pender and Hamilton Streets for the 18-21 August 1912 visit of the Duke of Connaught. Contructed entirely of fir, it was reportedly held together only by it's own weight as no nails, bolts or fasteners were used. It was later moved to Stanley Park until dismantled in 1947. 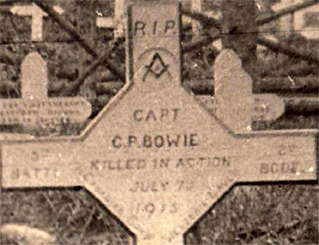 He was killed by a sniper while serving with "A" Company, 5th Battalion south of Ieper (Ypres) in 1915.